Continuity mistake: When Bugs is pretending to be dead, there is nothing behind him, but two shots later, a tree and two leaves appear from nowhere. Continuity mistake: When Elmer is holding the skunk in his hand, there is nothing by him. But when he puts the skunk down, his gun appears from nowhere. Continuity mistake: When Elmer thinks he has captured Bugs in his trap, there is a sign by the trap that reads "Carrots." In the next shot, the sign has gone. Continuity mistake: When Elmer chases Bugs, Bugs runs into his hole and Elmer drops his gun by the hole. But when Bugs kisses Elmer, we cut back to him and the gun has disappeared. Continuity mistake: Elmer is standing by a hole when Bugs is hopping around, but when he tells the audience that this fellow is a "RABBIT", we cut back to Elmer and the hole has gone. Continuity mistake: When Bugs is hopping around, Elmer does not have anything in his left hand. In the next shot, he is holding his gun, and in the shot after that, the gun has gone again. Continuity mistake: When Elmer says "Wabbits, wabbits!" to Bugs, Bugs is holding a carrot in his left hand. In the next shot, the carrot has disappeared. Continuity mistake: When Bugs' hand comes out of his hole looking for the carrot, there is a leaf by the hole, which wasn't there when Elmer put the carrot down. Continuity mistake: When Elmer places the carrot by Bugs' home, the rabbit tracks around the hole keep disappearing and re-appearing between shots. Continuity mistake: When Elmer first sees rabbit tracks, there are two big tree trunks in the background, but when we cut to Elmer in the next shot, the trunks have disappeared. Elmer Fudd: Doggone you, old, mean wabbit. 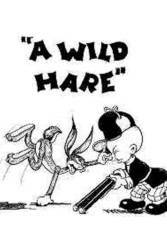 "A Wild Hare" is considered by many historians as the first "official" Bugs Bunny cartoon.